Gift of the sitter's sister, Eleanor Custis Stuart [b. 1796], Alexandria, Virginia, to her great-niece, Rebecca Lynn Webster [b. 1861], Rochester, New York; (Jonce I. McGurk, New York); sold 5 August 1919 to (M. Knoedler & Co., New York); purchased 3 March 1923 by Thomas B. Clarke [1848-1931], New York; his estate; sold as part of the Clarke collection on 29 January 1936, through (M. Knoedler & Co., New York), to The A. W. Mellon Educational and Charitable Trust, Pittsburgh; gift 1942 to NGA. Letter from Rebecca Lynn Webster, 5 August 1919, to Jonce I. McGurk, New York (typed copy, NGA curatorial file). For their relationship and dates of birth (dates of death are undetermined), see Robert Winder Johnson, The Ancestry of Rosalie Morris Johnson, Philadelphia, 1905, 30, 41. According to Jane Stuart, "The Stuart Portraits of Washington," in Scribner's Monthly 12 (July 1876), 373, the portrait was owned by Mrs. George Goldsborough, granddaughter of Mrs. Robinson's half-sister Mrs. Thomas Law. Lawrence Park, Gilbert Stuart: An Illustrated Descriptive List of his Works, with an Account of his Life by John Hill Morgan and an Appreciation by Royal Cortissoz, 4 vols., New York, 1926, 650, states, however, that the painting was only on loan to Mrs. Goldsborough, who lived in Talbot County, Maryland. The dated receipt for McGurk's sale to Knoedler is in the NGA curatorial file. The Knoedler invoice dated 28 February 1923 is in the NGA curatorial file; the name of the seller and the date of purchase are recorded in a copy of Portraits by Early American Painters of the Seventeenth, Eighteenth and Nineteenth Centuries Collected by Thomas B. Clarke, Exh. cat., Philadelphia Museum of Art, 1928, annotated with information from files of M. Knoedler & Co., NY (copy in NGA curatorial records and in NGA library). Mason, George C. The Life and Works of Gilbert Stuart. New York, 1879: 250. Park 1926, 649-650, no. 711, repro. American Paintings and Sculpture: An Illustrated Catalogue. National Gallery of Art, Washington, 1970: 106, repro., as Mrs. William Robinson. American Paintings: An Illustrated Catalogue. 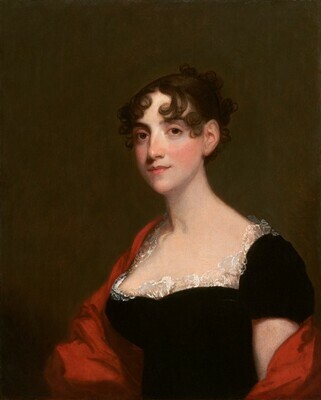 National Gallery of Art, Washington, 1980: 234, repro., as Mrs. William Robinson. American Paintings: An Illustrated Catalogue. National Gallery of Art, Washington, 1992: 355, repro., as Mrs. William Robinson. Miles, Ellen G. American Paintings of the Eighteenth Century. The Collections of the National Gallery of Art Systematic Catalogue. Washington, D.C., 1995: 246-249, color repro. 247.